When converting the loft getting the flooring right is obviously important. The existing flooring in a loft is unable to bear any great weight, and this must be dealt with if the roof area is to be used for storage or to provide extra living space. The main problem is that the existing joists are only able to bear very light loads. The joists in older houses tend to be stronger than those in newer ones, but they will still need to be strengthened. How you plan to do this will depend on the kind of loft conversion you wish to cary out. As when laying loft boarding, the existing joists can be strengthened with a layer of new joists set at 90 degrees to the originals. But for more substantial strengthening, reinforced steel joists will probably need to be used in the attic loft conversion. The need to strengthen the joists is also determined by just how strong the supporting walls are. To discover to what extent the existing joists need to be strengthened you will need to ask an engineer to make some structural calculations. The kind of flooring to be laid will also depend on the use which is going to be made of the loft space. 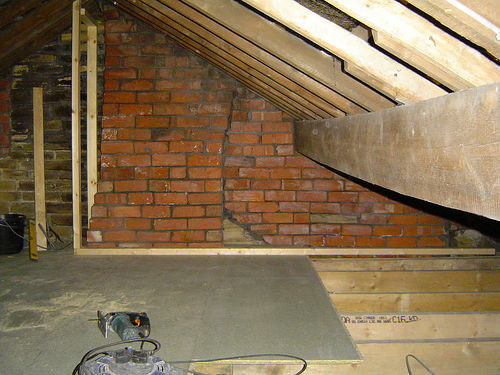 Chipboard and timber are the most common type of flooring in the loft. A resin compound is often used in the manufacture of the flooring to give it additional strength. When both fitting new joists and laying the flooring it is important to watch out for any cables which run through your loft space, especially if they don't run through specially bored holes in your existing joists. They may run on the top of the existing joists, so be careful you don't break or pierce them It may be advisable to provide some kind of kind of protective cover for them. The same caution should be used in relation to any pipes which may also run through the loft space. When considering the loft flooring it is advisable to guard against any worse case scenarios, particularly insect damage and wood rot. So it is important that any timber used in the work is treated.